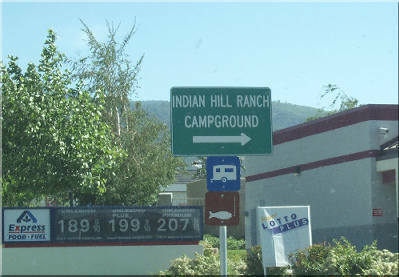 As you travel from Highway 58 to Indian Hill Ranch a number of local businesses stand ready to provide goods and services that you may need. On Tucker Road as you head south from Highway 58, on your left is Henry's Café. This is a great place for breakfast on your way out of town since it will be on the right and easy to park. Further south on Tucker Road, you will come to the main commercial area of Tehachapi and a 4 way light complete with turn arrows. All four corners provide commercial services and products. Merle Norman Cosmetics and beauty supplies, Save Mart, Rite Aid, Jack in the Box, Mc Donald's, Baskin Robbins, Albertson's to name a few. There is also an Italian restaurant, a Chinese restaurant and a Subway in the Save Mart Center. By the way, always lower priced deisel is on Tehachapi Boulevard as you head east out of town is at an independent "Discount Fuel" station (Stop N' Save) just past the high school football field on your right (south). J.F.Y.I. There is also a K-Mart and Burger King on Tehachapi Boulevard as well. Downtown Tehachapi is a tourist delight with food, shops & history. As you turn onto Valley Boulevard and head west, you pass a Standard Gasoline and convenience store (Stage Stop). Heading on west on the left is Radio Shack, Domingo's Mexican Restaurant, , and if you head up (turn left) on South Street you will find True Value Hardware and Don Juan's Restaurant. As you leave the last commercial area heading west on Valley Boulevard, you will travel around a sweeping right curve, that is followed by a left turn lane. Turn left off the highway here onto Banducci Road. Banducci Road makes a sharp right turn about 400' ahead. Make the right turn following Banducci Rd. around the corner and up a rather steep left bend (drop down in gears) you will see a small Indian Hill sign directing you to make a left (sort of) onto Arosa Road, just ahead. 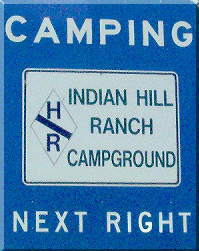 You are almost there, with 1-½ miles to go, and a climb of 500 feet to 5,000 feet msl at our entrance. Arosa Road meanders along Brite Creek without sharp bends; it is a climb however so drop down in gears and enjoy the country scenery, the giant oaks along the creek, and Tehachapi Mountain view through your windshield. Summer or winter, the temperature will be dropping as you climb the grade. If you like our landscape, see TehachapiRealEstate.com and buy some.